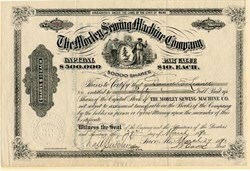 Beautifully engraved certificate from the Morley Sewing Machine Company issued in 1890. This historic document was printed by J.H. Bufford's Sons and has an ornate border around it with a vignette of the maine State Seal. This item has the signatures of the Company's President and Secretary and is over 115 years old. In 1880 James Morley invented a sewing machine with which to attach buttons to high button shoes. In the ten years that he spent developing the machine, he discovered that he needed buttons of uniform size, which were not then available. So when he organized the Morley Button Sewing Machine Co. in 1890, located then in Beverly, Massachusetts, he began to make buttons as well in the small shingled building below. The manufacture of buttons came to dominate the business, and the production of sewing machines was discontinued. Shoe buttons were made of fiber, and that technology led Morley to produce fiber-headed nails for upholstery and for electrical wiring. In 1895 the company needed to expand and moved from Beverly to the present location at "the cricket field" in Portsmouth. Within four months the original three-story building was erected, and the business was so successful that Morley became the largest manufacturer of shoe buttons in the world. In 1899 Morley combined with five other plants making shoe buttons. These factories were then closed, giving Morley a monopoly. Frank Jones became president of Morley in this period and erected a power generating plant (at the rear of Gallagher's Place) which also served his brewery and his hotels, the Rockingham and the Wentworth. A fiber mill was set up to make the fiberboard from which the buttons were punched. The button business prospered until World War I, when the military need for leather put an end to high button shoes. Morley moved to apparel buttons and later became the largest manufacturer of mattress buttons. 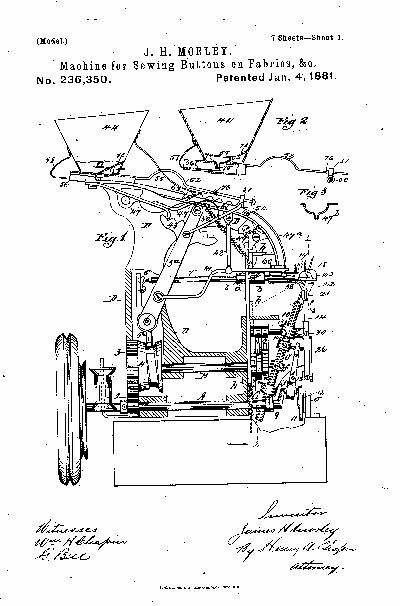 Other products included golf tees, fiber mats for printing newspapers, and, in World War II, gas masks.